Last month we had an ice cream sandwich cake recipe to beat the summer heat. But, when you can't beat 'em, join 'em! Chocolate always melts in summer, making a chocolate candy treat a little bit messy. Embrace the mess with a delicious raspberry and chocolate fondue sauce recipe that is so easy to make and utterly delicious! I don't know if you're familiar with Taste of Home, but I've used and loved their recipes for years. I recently saw a recipe for chocolate raspberry fondue and thought what a great choice it would be for an end of summer gathering. We tend to fight the weather all summer long. We don't want our desserts to melt in the summer heat. But this fondue sauce recipe eliminates that problem entirely! If you don't have a fondue pot, never fear. It's not necessary! You can serve this little beauty in a small crock pot or slow cooker to keep it just right throughout your party. It couldn't be much easier. Your Favorite Dippers - fresh fruit, pretzels, marshmallows, cubed cake, cookies, nuts, etc. Place all the sauce ingredients (first 5 in the list) in a heavy saucepan and gently heat on low, stirring frequently until completely melted. 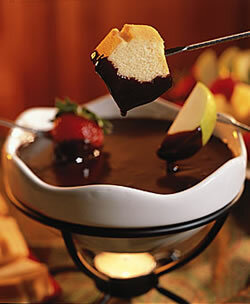 Pour your melted fondue sauce recipe mixture into your fondue pot or in a slow cooker to serve. Provide a selection of 'dippers' and fondue forks or skewers. Can you beat that? How wonderfully easy. I can almost guarantee that any time you serve this chocolate raspberry fondue sauce recipe, you'll be a big hit. It's very "moreish" as they say in Australia. You just can't seem to get enough. Did you get your free sample chocolate candy bars from Mars yet? We did! Don't forget. Every Friday until the end of September Mars is giving away coupons for free regular size chocolate candy bars. Don't forget to dash over again today to Mars' Real Chocolate website and sign up for your own free candy bar coupon. The first 250,000 people to sign up each Friday get a free bar. August - use code "09958" without the quotes. Sept. - use code "04510" without the quotes. SBI is running their annual Autumn Special. It's the program I use to build and maintain Chocolate-Candy-Mall.com (with no prior web experience). 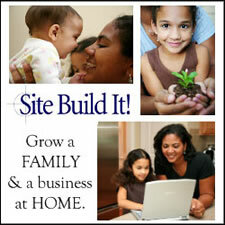 If you've thought about starting a home business, definitely take a look. I love the program and consider it a great blessing in my life. I hope you enjoyed this issue of Charmingly Chocolate with the chocolate raspberry fondue sauce recipe and the free sample chocolate candy reminder. If you have any feedback or comments you'd like to share with me, just reply to this zine and let me know.